Some of you may have already seen my latest free pattern that I posted last week. It was the ‘Blanket for Calais’ pattern which was based on the first blanket knitted by our knitting group and is offered in aid of an amazing charity called Side by Side Refugees. 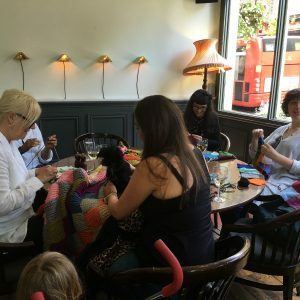 The knitting group was borne out of a Crafternoon we held in East London to raise much needed funds for Refugee Community Kitchen (RCK), whose volunteers feed over 3000 people a day in the refugee camp in Calais. 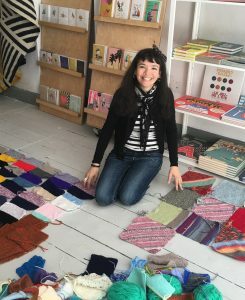 Among other activities, we knitted squares to be sewn into blankets to go in three caravans that were being renovated locally as part of a Side by Side and Jungle Canopy initiative, delivering caravans to the most vulnerable in Calais. The caravans provide a secure home for unaccompanied children of which there are currently over 800 in the camp (the youngest is only 8 years old), plus pregnant women and vulnerable families. 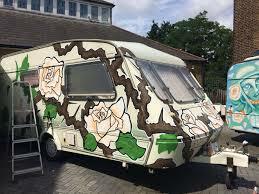 One of the caravans was painted with white roses and dedicated to the memory of the MP Jo Cox who was a close friend of our local MP Stella Creasy. 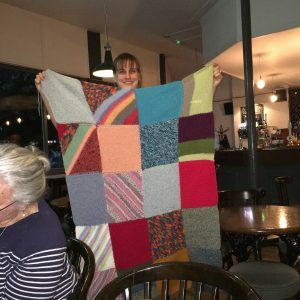 Our knitting group continues to meet up every week to knit and sew up blankets for refugees as the need will be even greater as the winter comes. 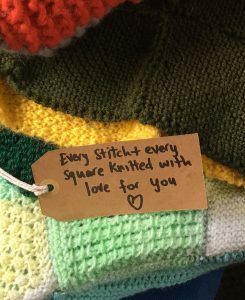 The lovely knitting community has also rallied round and we are sent squares from all over the UK. Each blanket made has a tag attached with the words “Every stitch and every square knitted with love for you”. Side by Side is a non-political organisation providing direct help to those living in the refugee camps of Calais and Dunkirk. They coordinate the donation and delivery of basic humanitarian aid, and help match volunteers and their skills to the areas they can bring most value. They work alongside other like-minded individuals and organisations, both in the UK and across Europe, to try and provide refugees and their families with the basic necessities they need to survive, and the support they need to rebuild their lives and form communities. Hi! This comment is not about the Calais pattern, but I didn’t see anyplace for general comments / questions, so I just threw in here. What I always wondered about is your children’s sweater patterns. I have always loved them, the way they are fitted, and wondered why you don’t write a lot of them as adult patterns. I like the “trapeze” type shaping of a lot of the children’s tops and the cute details…much more so than the patterns you have generally written for adults, and I figure I am not the only one, so why not?